With so much of the nation’s focus this week being affected by President Obama’s ongoing threats to both shut down the federal government on October 1, 2013 and to default on the nation’s debt three and a half weeks later as he refuses to negotiate with the U.S. Congress, you might have missed that the U.S. federal government’s bureaucrats are attempting to spend more money this week than in any other week of the year! At least, if how they behaved in the years from 2010 through 2012 is any indication. Bankrupting America provides the chart illustrating how much the federal government spends in by each week of its fiscal year – and we’re now in the final week of its 2013 fiscal year! Yes, those are BILLIONS of U.S. dollars! 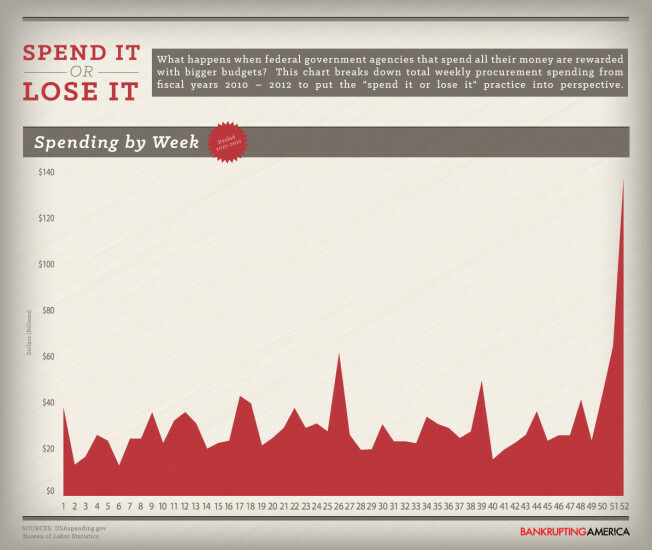 So many dollars are spent in Week 52 of the U.S. government’s fiscal year, about $140 billion on average from 2010 through 2012, that if the federal government’s civilian bureaucrats didn’t spend the money, they could keep the entire Department of Veterans Affairs, where the second-largest portion of the federal government’s bureaucrats work, running for an entire year! That won’t happen though – the incentives of the federal government’s bureaucrats are such that if they don’t spend that money now, they won’t get more to spend next year. Sadly, in Washington D.C., that’s all they really care about….